The American Bar Association’s ABA Blueprint 2.0 program has selected Lawyer Exchange to be part of its new practice management tool for small and solo law firm members. As part of this new service, Lawyer Exchange is able to offer discounted pricing for hiring project-based lawyers online to over 30,000 small and solo law practices who are members of the ABA. Focused on helping solo lawyers and small firms run modern and efficient law practices, ABA Blueprint 2.0 features an intelligent system utilizing machine learning technology to lead these lawyers through a law practice management audit. Once complete, Blueprint provides customized recommendations based on each user’s current practices, implemented tools, and requirements. As the exclusive provider of project-based virtual staffing, Lawyer Exchange can now offer an exclusive discount on service fees associated with hiring project-based lawyers online to participating ABA members. 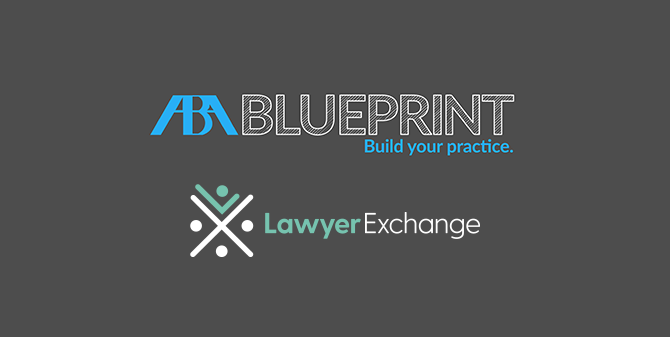 ABA Members can learn more about Lawyer Exchange’s special for ABA Blueprint here. Blueprint exists to help solo/small firm lawyers run modern law practices. While you need to be an ABA member to get discounts on participating vendors and some premium content, Blueprint is free to use by all interested legal professionals. The new Blueprint Bot takes you through several questions about your law practice and at the end produces a comprehensive and customized Practice Assessment with practice tips, content resources and vendor suggestions. Blueprint also has a Resource Center which includes vendors and content that will help you run a better law firm. Learn more by visiting abablueprint.com. The Lawyer Exchange platform helps small & solo practices looking for on-demand, project-based support, find lawyers looking for project based legal work online. Whether you need regular help or assistance for just an hour or two, finding support is now simple and easy. Post your legal project in minutes and you’ll start receiving proposals from project lawyers eager to help to get the job done fast.